The Machine Talks – Music, Commentary and Harmony. On today’s episode, we have lead guitarist of Pareidolia, Steve Dadaian, as well as concert photographer and editor of Alternative Revolt, Josh Lowe. Steve, Josh, and I talk about opening for Yngwie Malmsteen, fighting a crowd for the perfect photo, as well as their trip to LA for NAMM. On this special Christmas episode of the podcast, I am joined by the super-talented Phil Katrandjian. Phil tells us what it’s like to have perfect pitch, we wax poetic about the Dell Jukebox, and we play a smooth original featuring violin and a 1974 Fender Rhodes. Snow was falling past midnight on a winter night. I was sitting, parked in a snowplow truck, idling in a parking lot. The cab of my truck was illuminated blue with the ambient light from my cell phone. After a minute or so, I settled on a new album to listen to. A series of guttural screams erupted in my truck. A Gregorian choir stood nearby, accomplices in the darkness. The screams ping-ponged back and forth across the bench seat. A woman’s voice rose, clear and loud through the cacophony. She told me that somewhere, a woman was crawling. Alone. I shifted into drive and continued plowing. That was my first listen to Childish Gambino‘s 2013 album Because the Internet. The track, “I. Crawl,” is a boisterous opener that paves the way for 17 other tracks of Childish Gambino’s powerful, yet thoughtful, hip hop. (Listen to episode 3 of the podcast to hear my take on the importance of strongly opening an album.) The album plays with rhythm and hooks in truly interesting ways, and that was what kept me coming back to it. Hi-hats that slink and swing around the pocket, kick drums that burp and bubble, samples that are smashed and crushed past the point of recognition. Over the span of the record, Childish Gambino deals lyrics fast, hot and snarky at times, and at others, low, introspective, and deadpan. It’s a good one. My experience enjoying Because the Internet motivated me to listen to Childish Gambino’s back catalog. His previous album was his debut LP Camp. My big listens on Camp were “Bonfire” and “Heartbeat.” Both tracks are showcases for Gambino’s lyrical talent; “Bonfire” hurls angry, though clever, stanzas at the audience, whereas “Heartbeat” is a constant rise that opens with the solemn notes of a distant piano and climaxes in a crescendo of accusations against a former lover. The lyrical content of the album seems to have been heavily influenced by the birth of Childish Gambino’s first child. Song titles and lyrics across the album have references to the relationship between parent and child. The last three tracks on the album, “Baby Boy,” “The Night Me and Your Mama Met,” and “Stand Tall,” take us through the process of meeting a newborn child, seeing him grow, and sending him off into the world with the well-meaning wisdom of a caring parent. The instrumentation of “Awaken, My Love” is eclectic, though rooted in the groundwork of soul. There are more guitars, electric pianos, basses, and choirs in this album than all of Childish Gambino’s prior albums combined. In 2014, Childish Gambino released an EP, Kauai, that foretold this shift. The leadoff single from Kauai, “Sober,” is an R&B tune that, by way of a bouncy Rhodes riff and a fat synth in the bridge, tells the story of a man high in love – or perhaps high on the concept of love. Me and Your Mama: Opening with an alto and soprano choir, the first two minutes of this track lull you into a loving haze – Childish Gambino is saying he loves you when he’s high. A fat 808 kick thickens over the span of the movement, and a hi-hat is introduced, adding structure. Suddenly, a guitar riff rolls down a rock slide of toms, and Childish Gambino starts pleading to be let into your heart. His vocals are screamed and strained. The scope of the song is massive, and the tone reminds me of “The Court of the Crimson King.” The transition from ethereal choir to distraught rock is brash and effective. As an opener, Me and Your Mama does an excellent job setting the foundation for the album. Have Some Love: I was greedy. This album came out on December 2, and as I lay in bed the night of December 1, I realized that it must have been past midnight. I started listening to “Awaken, My Love!” in a half-asleep haze, eager to hear the contents within. I got to track two, “Have Some Love,” and to be honest, I wasn’t really feeling too hot on it. It felt thin and out of place. I listened to the first third of the album and went to bed. The next day, as I listened to the album in my car, I realized my problem: cellphone speakers are crap for music listening. In my haste to listen to the album, I cut out the low-end. The bass line in “Have Some Love” kicks and bubbles throughout the track, constantly ascending. Without the bass, the acoustic guitar floats and hovers without confidence, but with the bass line, the acoustic guitar has ample real estate to take purchase. Listening to the song on my car stereo, I had a stupid grin on my face, and loved every second of it. Boogieman: My gut tells me the lyrics of this song have a powerful political message, but that only became apparent to me on repeat listens. I was distracted because the aesthetics of the track have Frank Zappa written all over. The instrumental riff being doubled by the “oohs” of a choir, along with the toy piano synth at the end of the verse show lots of the trappings of Bongo Fury‘s “Muffin Man.” The dichotomy of a satanic laugh floating over the clank of a cowbell during the riff is a really special kind of weird. Redbone: Released two weeks before the album as the second single, “Redbone” was a tremendous bellwether, and the reason why I was so eager to listen to the LP. The track opens with a high drone on distant violins, à la Nightmares on Wax‘s “You Wish.” The main riff is a phased guitar, doubled with glockenspiel. The phrase floats serenely over a solid bass line with popped accents. It’s so smooth. Childish Gambino’s vocal performance in this track is a very interesting falsetto – it almost feels like he’s putting on a character. “My peanut butter chocolate cake with Kool-Aid.” …He makes that line feel cool. A choir emerges in the chorus and brings the song the fullness that is present at all the high points of the album. Sending the song into the sunset, the outro features a bubbly reso-bass synth and intertwining synth and guitar lines, to great effect. Baby Boy: I’m biased. It opens with a clavinet, which is accompanied by a muffled, cocktail drum kit and a nice thick bass. I could listen to that composition for years to come. Childish Gambino’s vocal performance is a more confident falsetto in this track, and whispers about loving moments discovering the traits of his child. The chorus features him pleading to keep his son forever, while an auto-filtered group of backup vocals glimmer in the background. The song comes to a simmering crescendo after a spoken-word bridge. Childish Gambino wails with agony as a B3 emerges, adding the drama and tension that only a B3 can. “Baby Boy” is a truly thoughtful track – one that has only come to be more interesting every time I listen to it. Stand Tall: “Stand Tall” feels like the final bow at the end of a one-man show. Through the album, Childish Gambino’s vocals are nearly always filtered or effected in one way or another. The audience knows it is him, but we can never catch a full glimpse of the man. This track is the reveal. After method acting the entire LP, his naked voice sings in its natural key, preparing his son to endure the rigors of a difficult life. Coming after the instrumental interlude “The Night Me and Your Mama Met,””Stand Tall” has several movements of its own. It opens with Childish Gambino’s vocals accompanied by wah-wah filtered guitar, eventually joining with the traveling choir that weaves its way through the album. A flute chirps in through the open window between two verses. After a silent beat, a fat polysynth sets the landscape for the second half of the song. Friendly, though mysterious, the synth is a true juxtaposition to the instrumentation of the first movement. As quickly as it came, it leaves, revealing an outro chorus of strummed acoustic guitars and bongos evoking the likes of Bill Withers. My takeaway from this album is that Childish Gambino is a truly promising artist, in the early stages of a prolific career. Throughout the three-act span of Childish Gambino’s discography, he has shown impressive versatility and walked with confidence through the genres of hip-hop, R&B, soul, and funk. His take on soul is thoughtful and dramatic, and has absolutely enveloped me. The album is not a vamp on old styles for publicity’s sake; it is soul, shaped and crafted to effectively and appropriately showcase the lyrical content of Childish Gambino. “Awaken, My Love!” has further proved his capabilities as a songwriter, composer, and producer. This is a record I plan on enjoying for a very long time. Episode 3 is here! Today, I had the pleasure of hanging out with multitalented New York City singer/songwriter Kelli Bruno. Kelli performed three songs and told me about her work as a performing musician in New York. We may have also read some Craigslist personals. Episode 2 is up! I really want to thank Mike and Lena for taking their time to be on the show. We had an excellent talk, discussing the Nashville music scene, the curation of workout playlists, and the merits of treating karaoke like a bloodsport. Listen here! The Machine Talks is now available in iTunes! Check it out! Episode 1 is up! It’s real! This thing is happening! Everything in the episode was produced by me. Music, too. Like I mention in the podcast, I hope for solo shows to be few and far between. I plan on having guests on the show, both in-studio and via Skype. This episode is more of a chance for listeners who don’t know me to learn about my history with music and the radio – that way I’m not a stranger in the future. Included here is a companion playlist for episode 1! This playlist includes most of the songs and artists I talked about on the episode. Pairing the podcast with the companion playlist is the best way to enjoy all the commentary. I hope you subscribe and enjoy! Below are some links to videos, bands, and tracks that I mentioned throughout the episode. 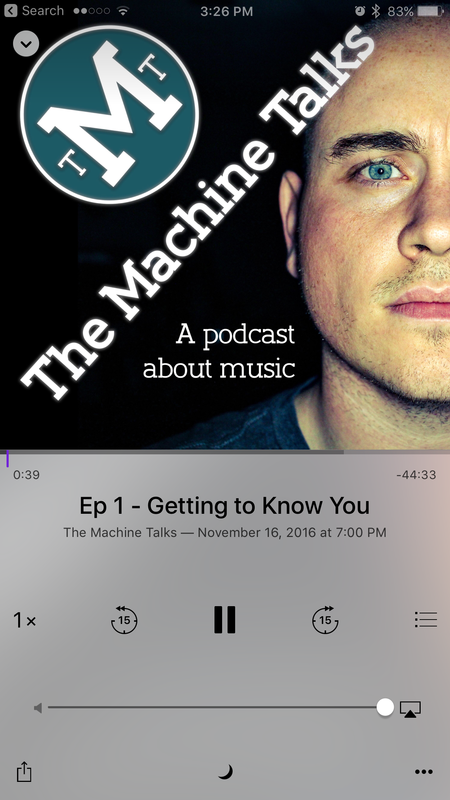 On episode 5 of The Machine Talks, we have lead guitarist of Pareidolia, Steve Dadaian, as well as concert photographer and editor of Alternative Revolt, Josh Lowe. Steve, Josh, and I talk about opening for Yngwie Malmsteen, fighting a crowd for the perfect photo, as well as their trip to LA for NAMM. Find the companion playlist at www.themachinetalks.com!